Which Component of Modern Cars Owes Its Name To Horses? Now A Sci-Fi Staple, The Term "Earthling" Originally Referred To? In modern automobiles the dashboard is a flat surface inside the car, beneath the windshield, that seems to exist solely for the purpose of creating space so your face isn’t pressed against the glass of the windshield (and to give bohemian passengers a place to throw up their boots). 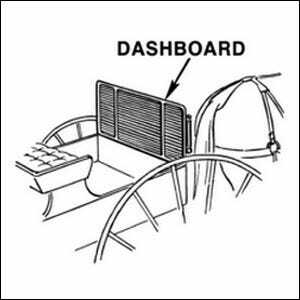 Historically, however, the dashboard wasn’t a flat surface for tossing newspapers and parking tickets, it was a vertical barrier at the front of a carriage between the driver and the horses. Whatever the horses hoofs dashed up from the road–mud, sticks, or manure–was deflected away from the driver on the dashboard. The dashboard isn’t the only component left over from the days of carriages. Once upon a time, the trunk wasn’t a distinct storage compartment, but a literal trunk attached to the back of the carriage.